← Clueless media libs STILL don’t know why we’re mad! Rush reads my blog and then speaks my thoughts on the radio. I love listening to Rush Limbaugh articulate on the radio what I have written on my blog. Sometimes I swear he reads what I write because what he advocates is the same as what I say, but I know that’s dreaming. My point is that liberalsbackwardsthink is not about demeaning the Left, but about helping others understand the propaganda that is the mainstay of the liberal media. Take the last FOX News GOP debate wherein the moderators pulled out their list of what the departments Trump says he would shut down cost. When confronted by the fact that something like the EPA doesn’t cost the government much, Trump should have responded with the fact that the EPA’s regulations costs the economy hundreds of billions of dollars. Making sure we have a clean environment is one thing, but they take it to the extreme of demanding a pristine environment and shake down any business from doing business without bowing at the altar of Gaia and man-made climate change. Those of us who understand both science and politics know that the entire climate change meme is a fraud to milk taxpayers of more money. The cost to the governmental budget is miniscule, but the damage they do to the economy is astronomical from shutting down energy production to restricting growth. This is why I write liberalsbackwardsthink because the people need to learn so they stop making the fatal error of voting Democrat. As Limbaugh says, “…it is the Democrat Party that is the most destructive force in this country…” and people need to be educated to get past the propaganda of scapegoating Republicans, and realize that working with Democrats is what is destroying this great nation. They must not be bargained with, but defeated! 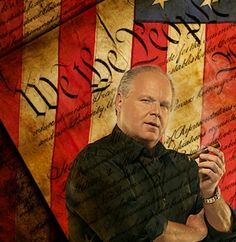 Both the GOP and liberal media are calling on Rush to stop Trump, but as far as Rush is concerned, and myself as well, if Trump can take down the elitists in Washington who are teaming up against the people down then more power to him! If Trump is not as conservative as Cruz does it matter? Cruz has been shut down by those in Washington and the media when he made his attempts to stop them. If Trump can succeed where Cruz failed what does it truly matter if he is not a Reagan conservative? Establishment types are blaming conservatives for not sticking to conservatism and going over to Trump. When the likes of Graham and Romney come out and tell us; conservatives are stupid for supporting a man who is rubbing their noses in their BS the same way he is doing it to the liberal media, why would we listen to them? They are the ones who allied with the liberal Democrats to damn and demonize TEA Party conservatives like Cruz! If they are as afraid of Trump as the Democrats are then he is the man to lead the Trump/Cruz ticket and give ‘em both barrels! This entry was posted in Election 2016 and tagged 2016 Democrat presidential candidate, 2016 Presidential Campaign, 2016 Republican Presidential candidate, Barack Obama, Bernie Sanders, Conservatism, Conservatism vs. Liberalism, Democrats, Donald Trump, Elections 2016, Hillary Clinton, John Kasich, Liberalism, Marco Rubio, Republican Convention, Republicans, Rush Limbaugh, Ted Cruz. Bookmark the permalink. You are the best dusty rusty 🙂 keep on keepin’ on. You will win! Just don’t threaten that third party vote crap. The Left show who they fear by demonizing and impeding the message of those they fear. Dusty, you’ve obviously made the grade if they shut you out and censor you. Keep up the good work. Leftist sites don’t even allow free speech to take place in their comments. They censor everything before it gets said. But it is the rightwing sites that are shutting me out. Where’s the sense in that?